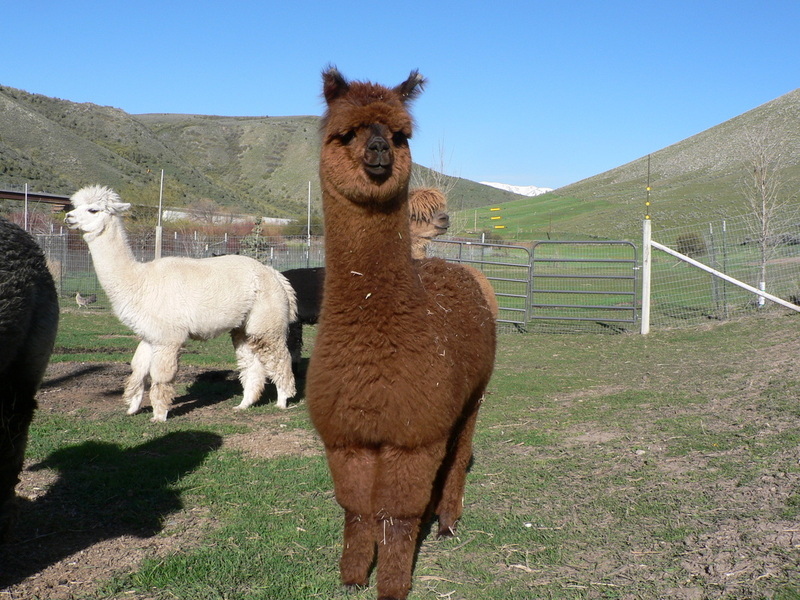 Female Alpacas for Sale All 26 of our Alpacas are for sale and we welcome all inquiries and offer package deals. If you don't see enough pictures here, I will be happy to send more. Or come by for a visit! Call first, we may be over at the Inn. 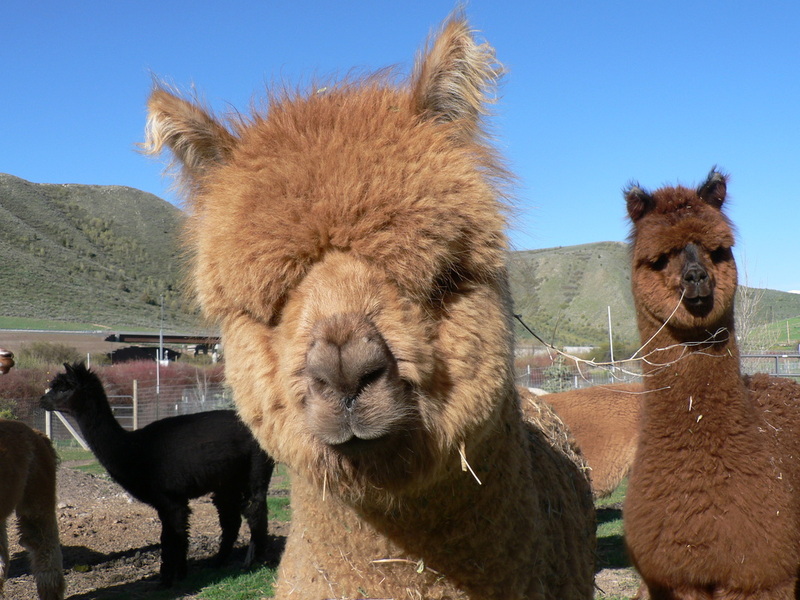 Ask us about our Alpaca Inn, just 6 miles from the farm in the historic town of Lava Hot Springs, ID. SPECIAL!! 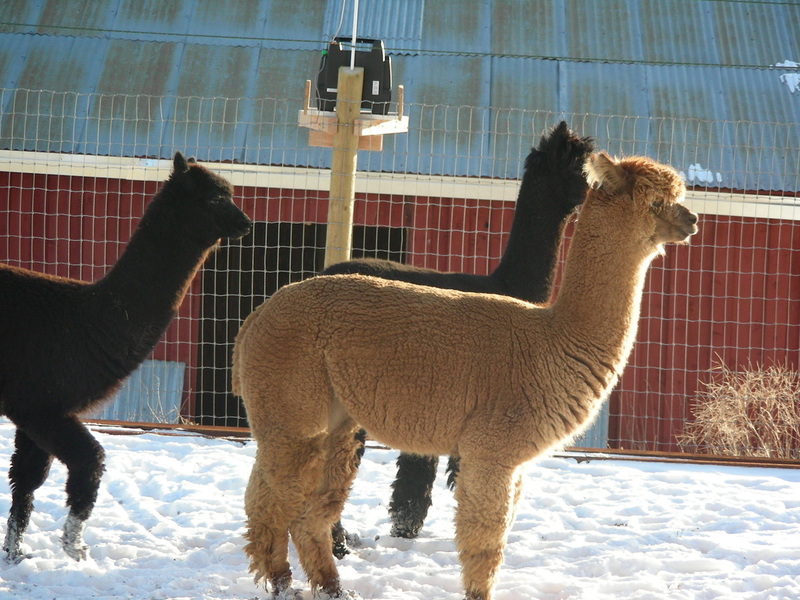 Purchase any alpaca and enjoy a two night free stay at the "Alpaca Inn" in Lava Hot Springs! 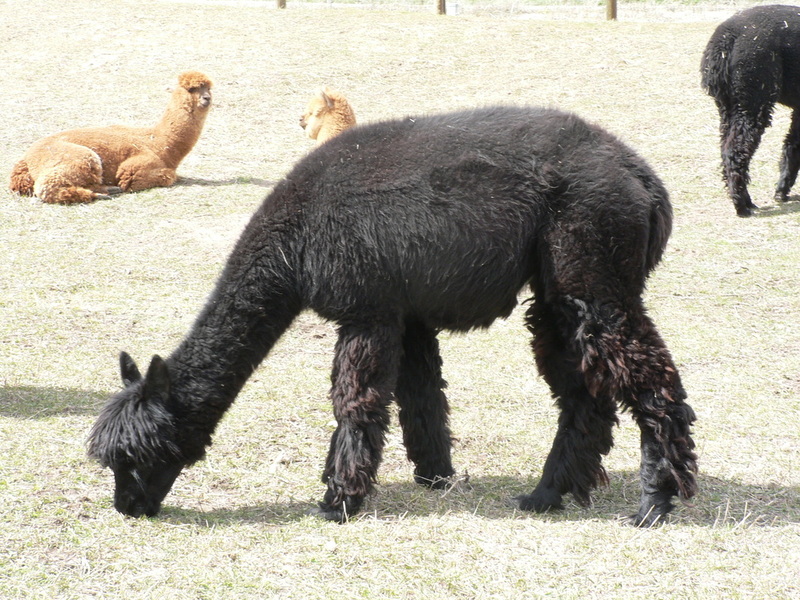 Beautiful, sweet, shiny, silky Shinsi is a True Black Alpaca. She is an exceptional Mom and has easy births. 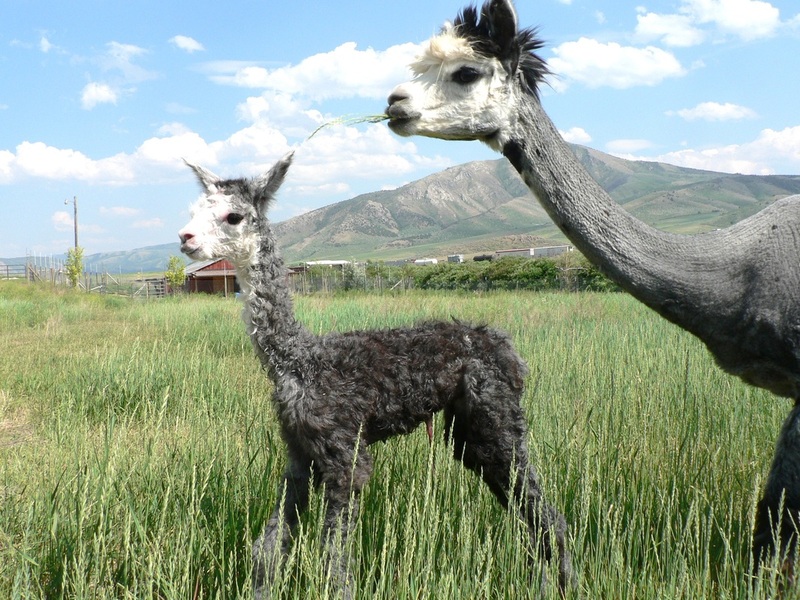 Her Shine and silky fiber passes on to all Shinsi's cria. 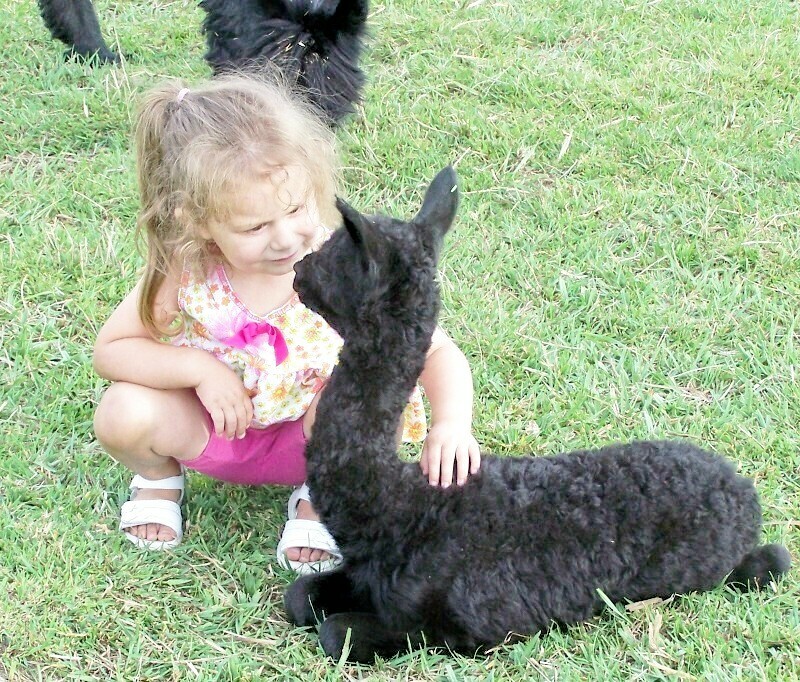 She guards the heard and isn't afraid of much, yet she is gentle and great with kids. 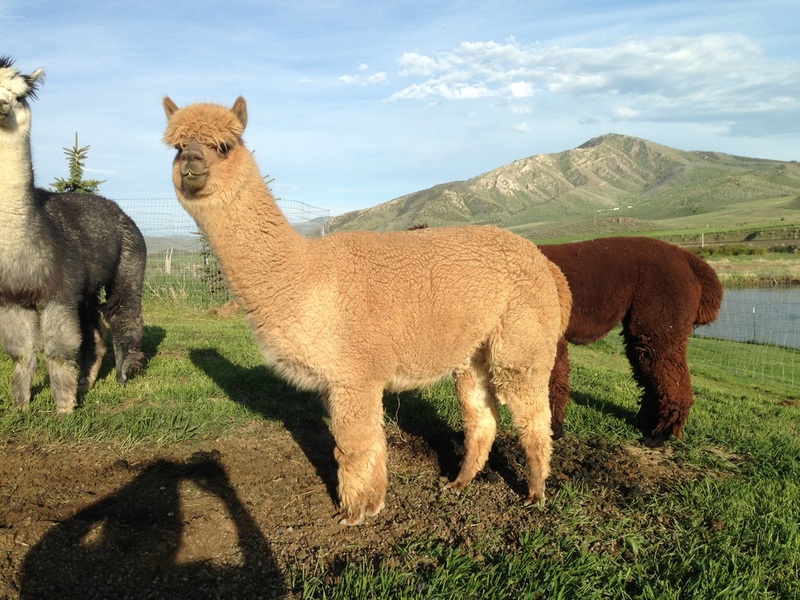 She is bred to "Teddy" and comes with a complimentary breeding to any of our herdsires and 6 months free board. 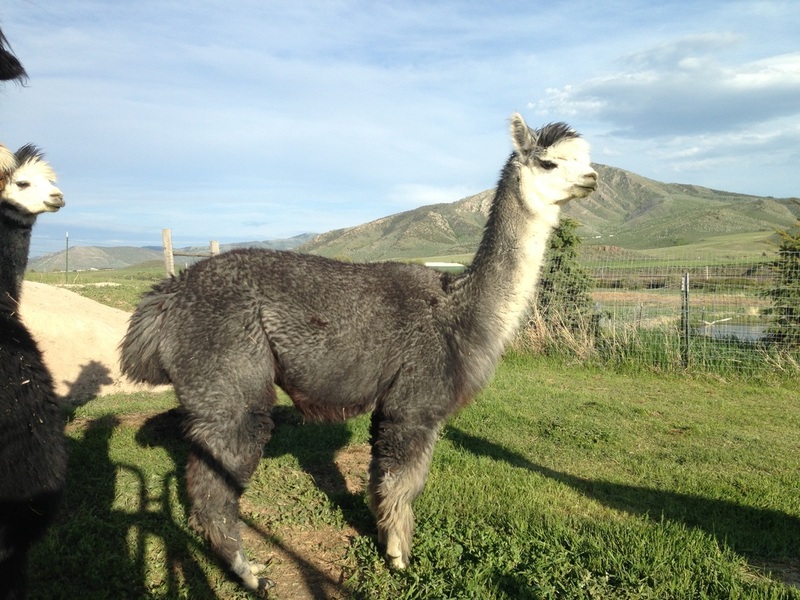 Gentle Princess Grace... She has a beautiful head and loads of med grey fiber, with grey undertones. Grace has a mellow personality and is very gentle to work with. She is a great Mom, with abundant milk for her babies. 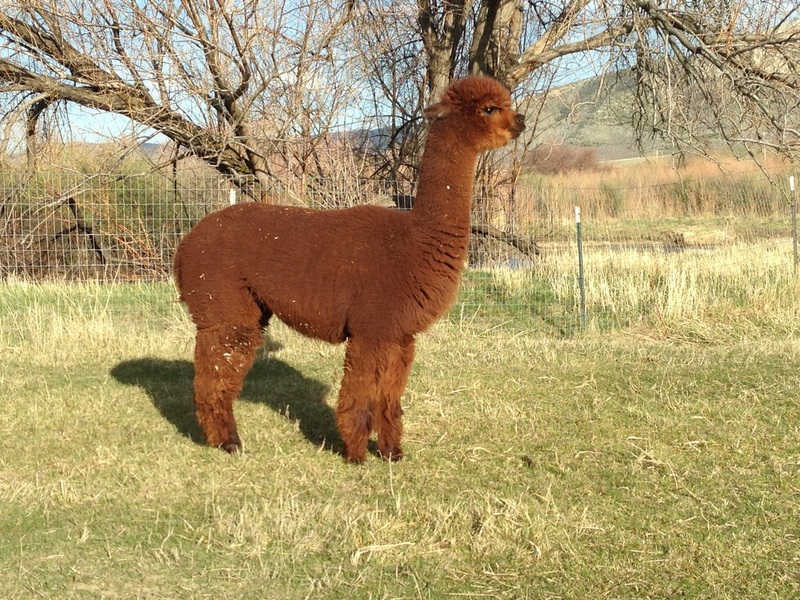 She is bred to "Milo" and comes with a complimentary breeding to any of our herdsires and 6 months free board. 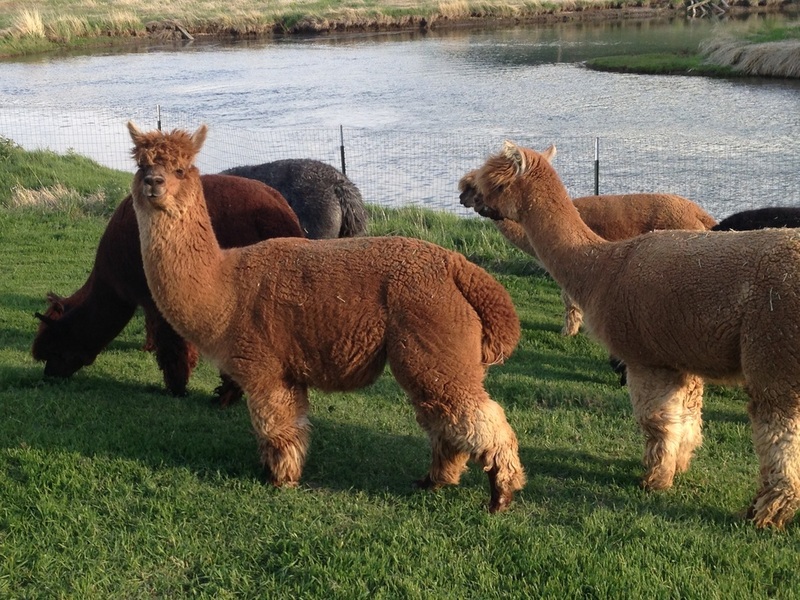 Ready to be bred to any of our herdsires. Meadow is a gentle sweetheart. She is very curious and loves to give kisses. 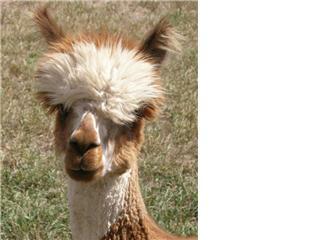 She is a great natured, gentle alpacas with dense coverage. she is an outstanding, easy birthing mom. 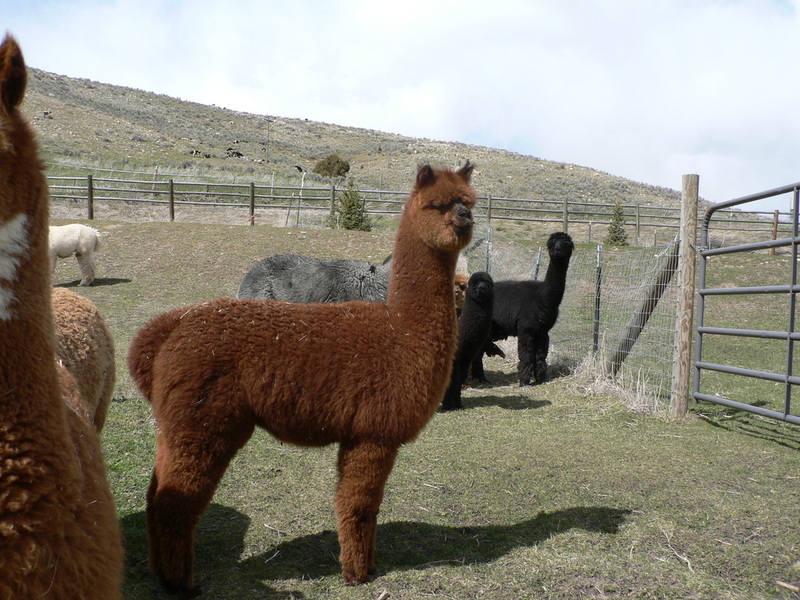 Her crias have exceptional fiber characteristics, density and strong confirmation. Meadow has a gorgeous head, a lovely medium fawn coverage with strong confirmation herself. We just love Meadow. It will be truly hard to let her go... call fast before I change my mind. 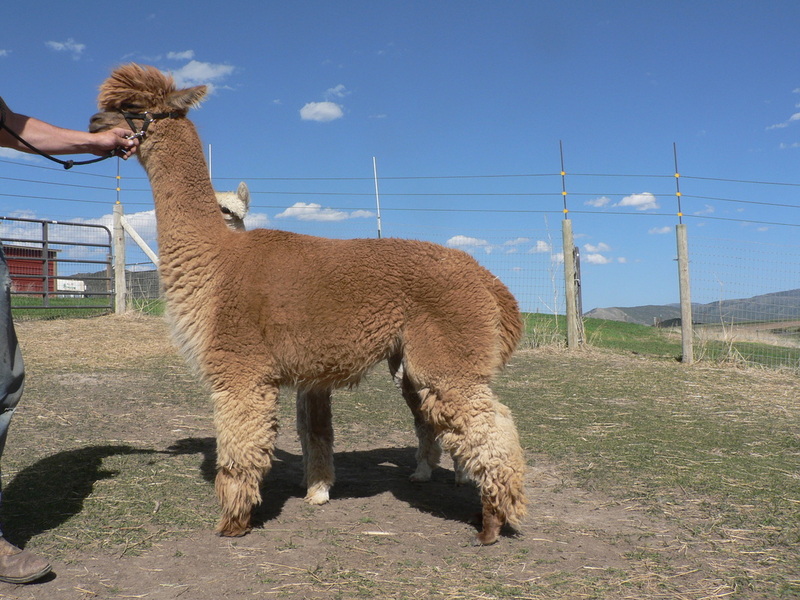 She is ready to be bred and comes with a complimentary breeding to any of our herd sires you choose and 6 months free board. Celina is a tall, curious, alpha with proud strong confirmation. I love to watch her graceful walk. She always wants to be the center of attention. She is a Medium Silver Grey. It is hard to think about letting this gal go. She is a wonderful Mom (all her babies have been girls) with plenty of milk. 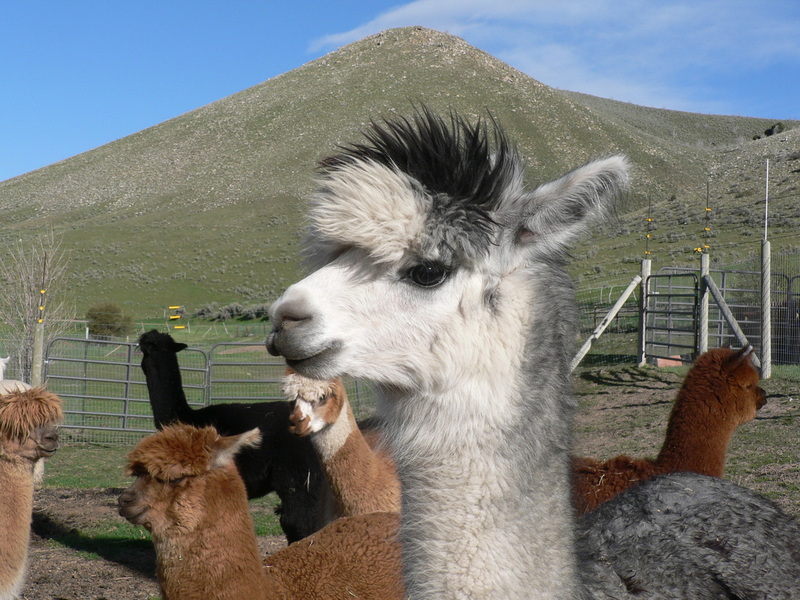 She is a granddaughter of Danko, one of the most well known grays in the alpaca industry. She is ready to be bred and comes with a complimentary breeding to any of our herdsires you choose and 6 months free board. 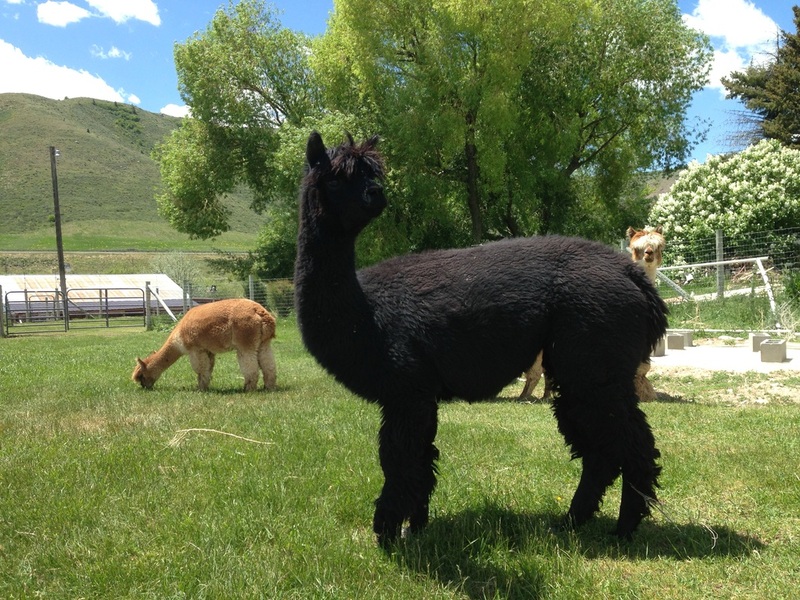 Malika is a True Black Alpaca with great confirmation and a delightful personality. She is well balanced and has great bone structure. 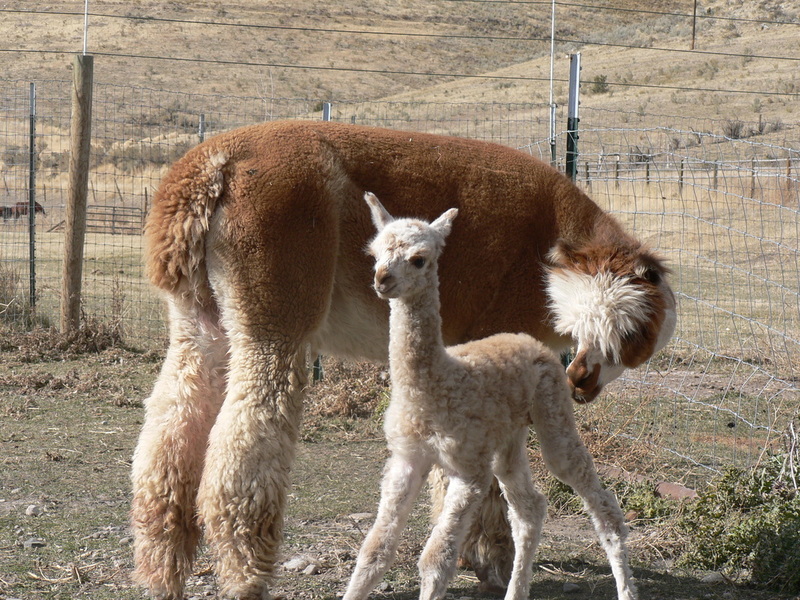 She is a great Mom with plenty of milk for her cria. 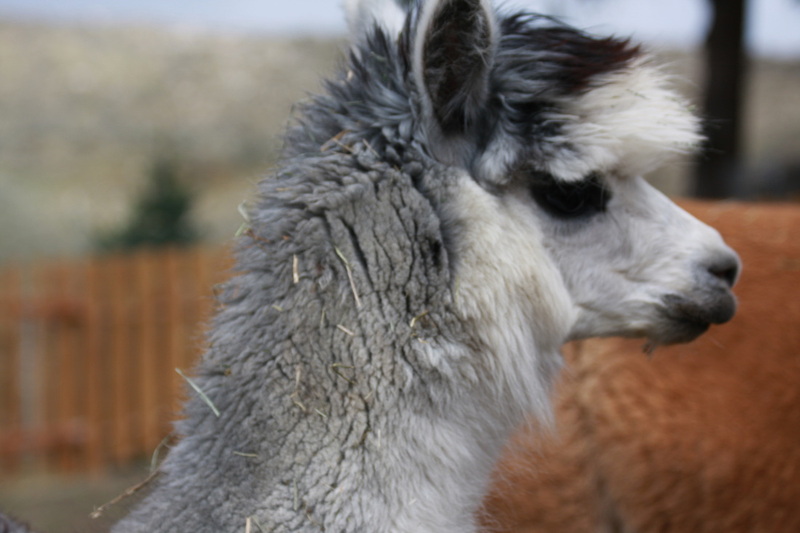 Her fleece is silky soft. 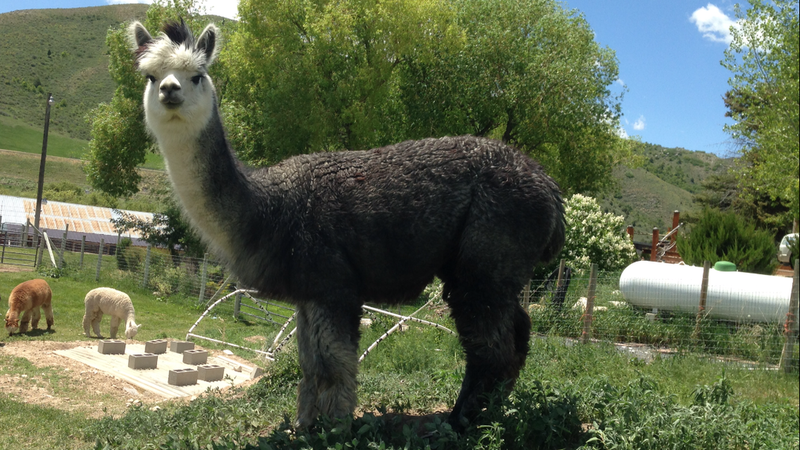 She is a great granddaughter of Danko, one of the most well known grays in the alpaca industry. 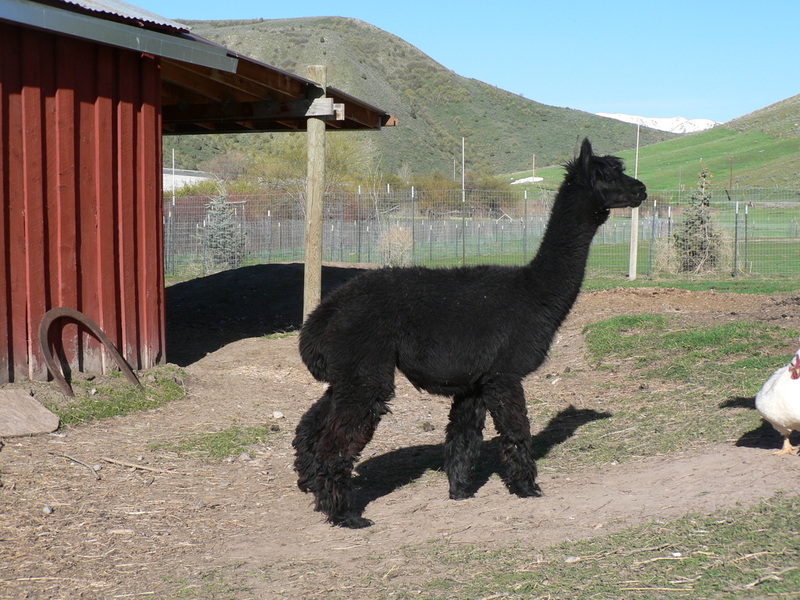 She is bred to Vin Diesel, our True Black herdsire with outstanding soft, silky fleece! 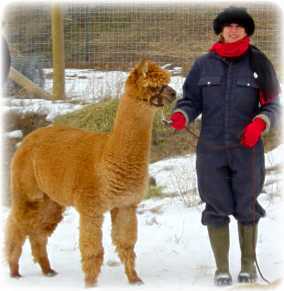 She comes with a complimentary breeding to any of our herdsires you choose and 6 months of free board. 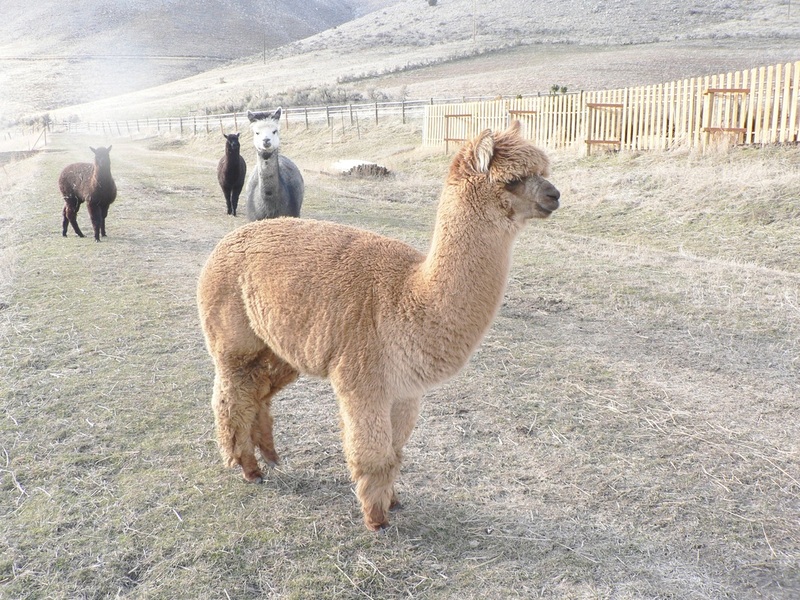 Sweet, shy Belle has soft luxurious silver grey fiber. Her adorable face makes you want to cuddle her up! Belle is a tall gal with great proud confirmation. She will be a wonderful asset to any breeding program. She is a great granddaughter of Danko. 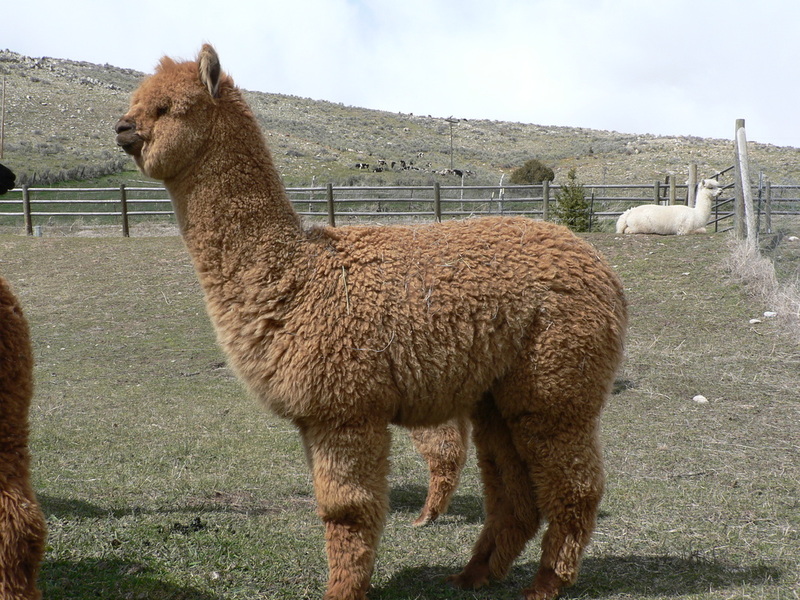 She is bred to Milo, a white herdsire with absolutely outstanding lustrous fleece. 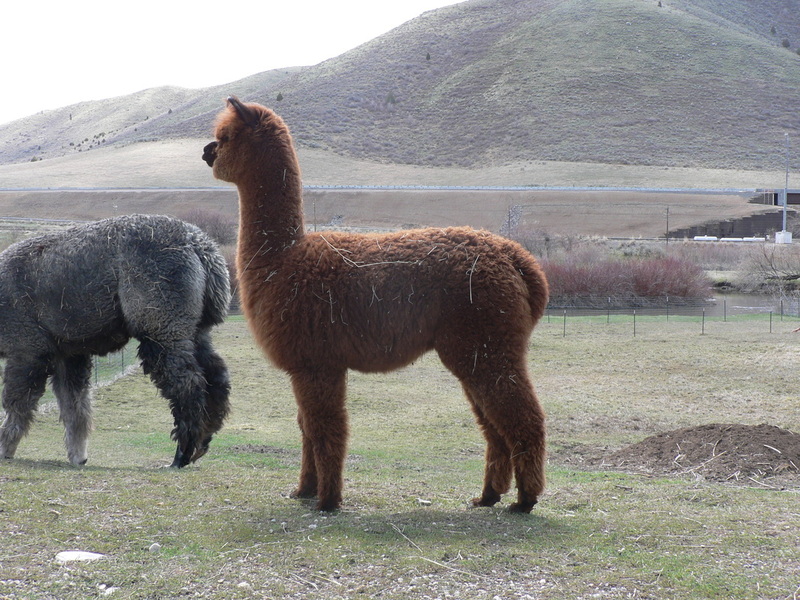 She comes with a complimentary breeding to any of our herdsires you choose and 6 months free board. 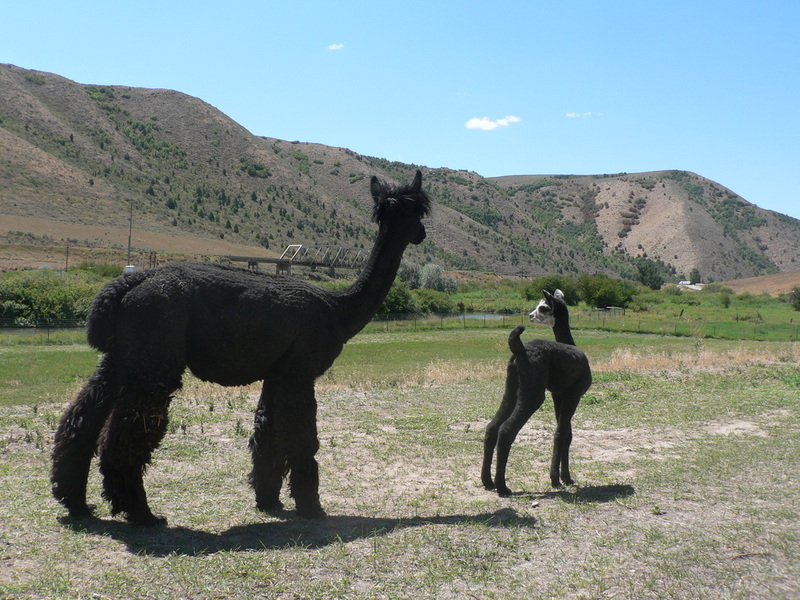 Lady is a tall gal with proud conformation. 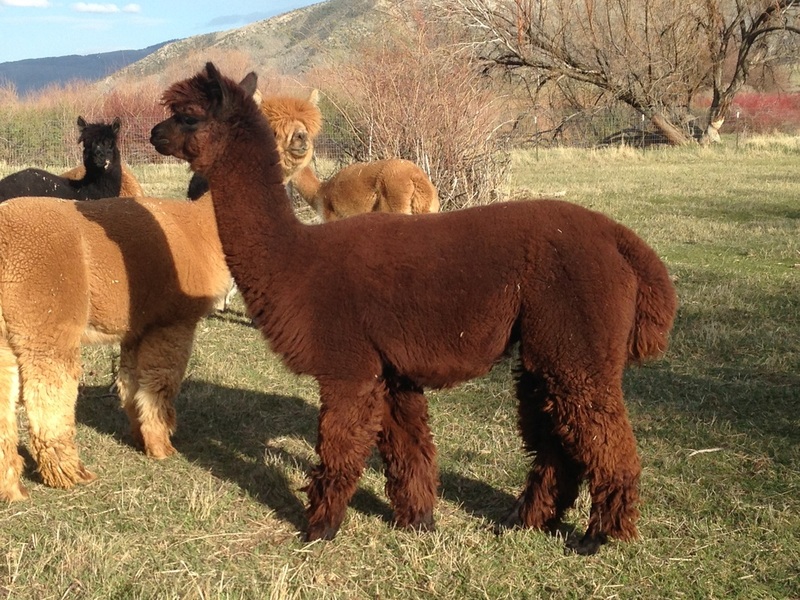 She has beautiful soft fleece and a wonderful maroon tint. With a grey mom, imagine the possibilities! Lady has a pleasing mellow disposition. She is ready to breed and comes with a complimentary breeding to any of our herdsires you choose and 6 months free boarding. Come take a look at her. You will fall in love. This lovely lady is adorable. 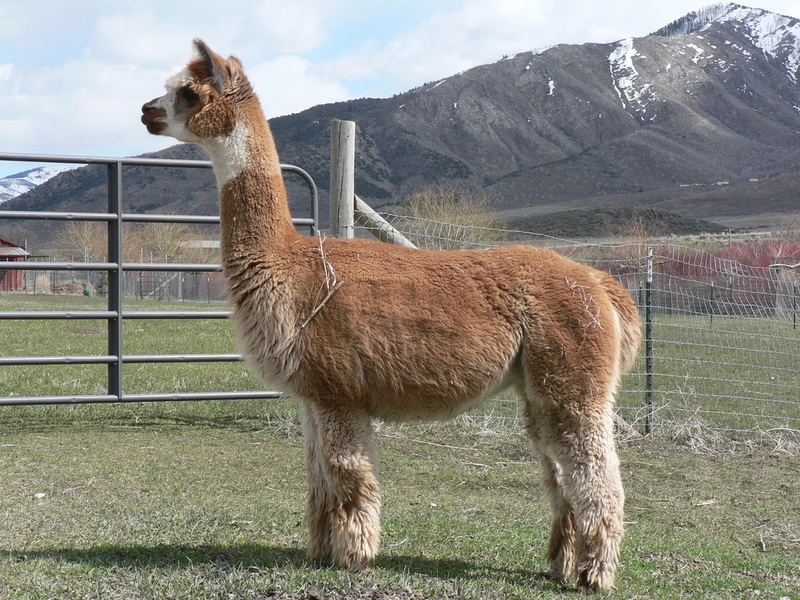 I love the color of her fleece. It is super silky!! She is good natured and calm. She is ready to be bred and comes with a complimentary breeding to one of our herdsires you choose and 6 months free board. 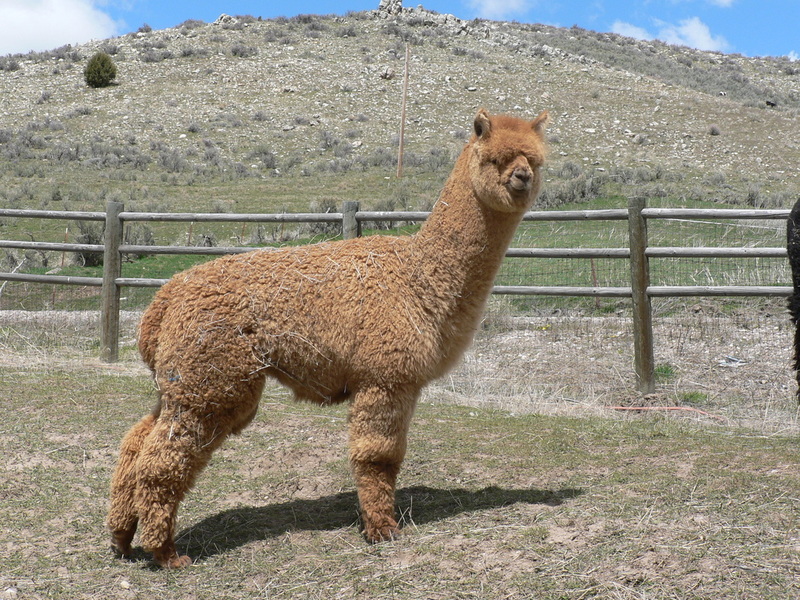 Savannah is my favorite alpaca of all time. I'm not sure if I can really depart from this gal. So be quick if you are interested. She is sweet, shy but has a wonderful personality. 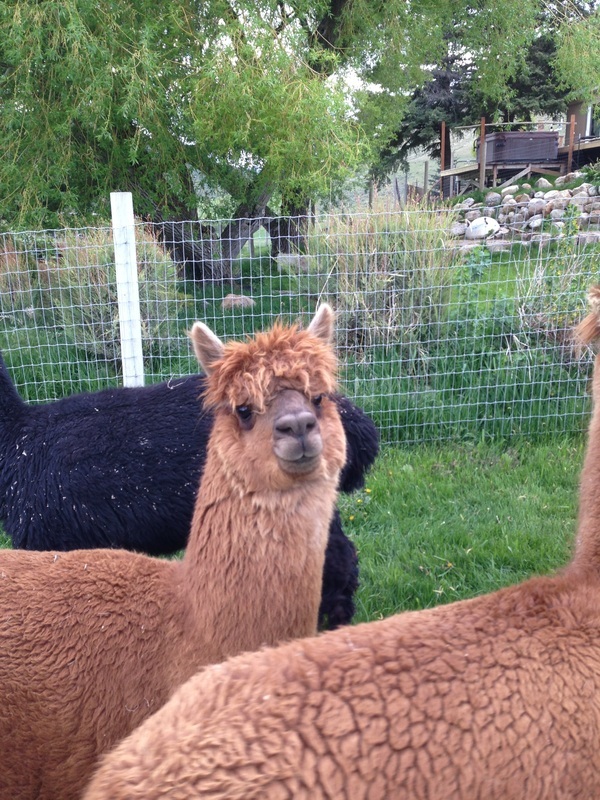 Her fleece is wonderful, crimpy and dense, just like her dad. 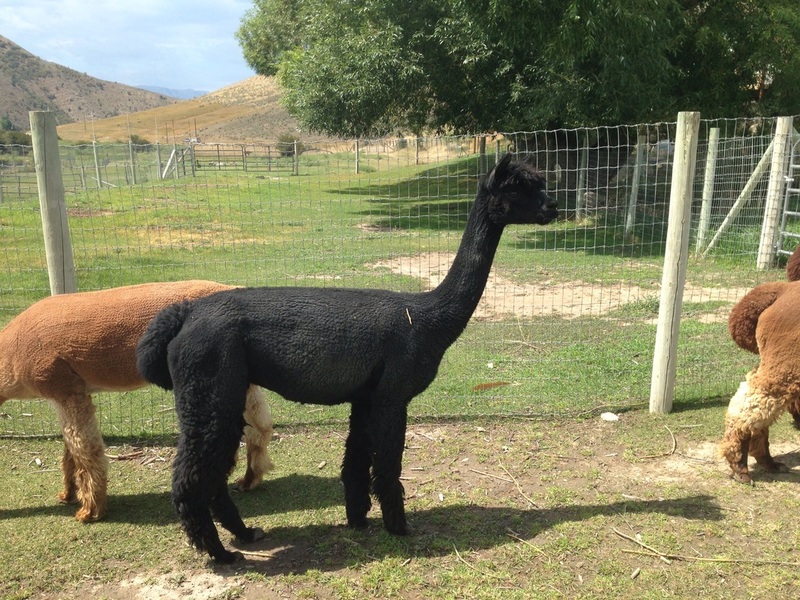 She is ready to bred and comes with a complimentary breeding and 6 months free board. 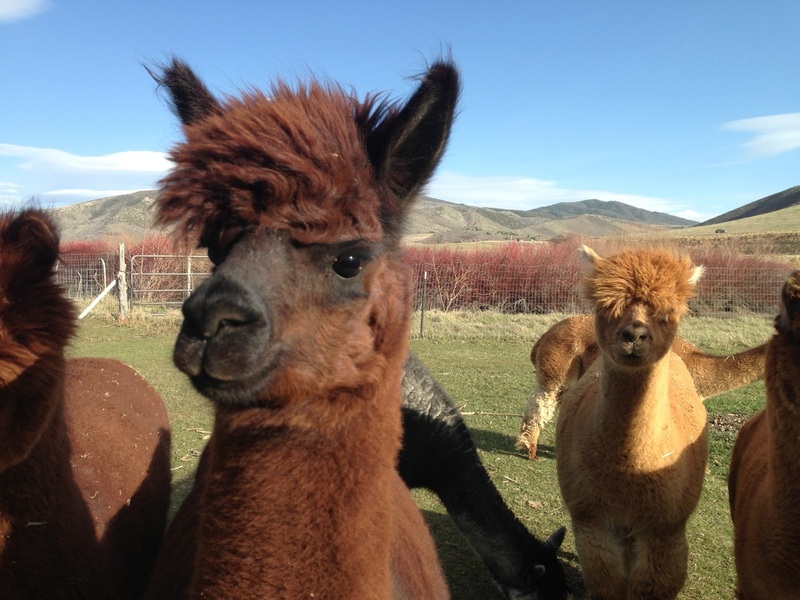 Latte has the finest, crimpiest, silkiest fleece on our farm. I just love the color. Latte is very shy. She is a momma's girl, and absolutely adorable! 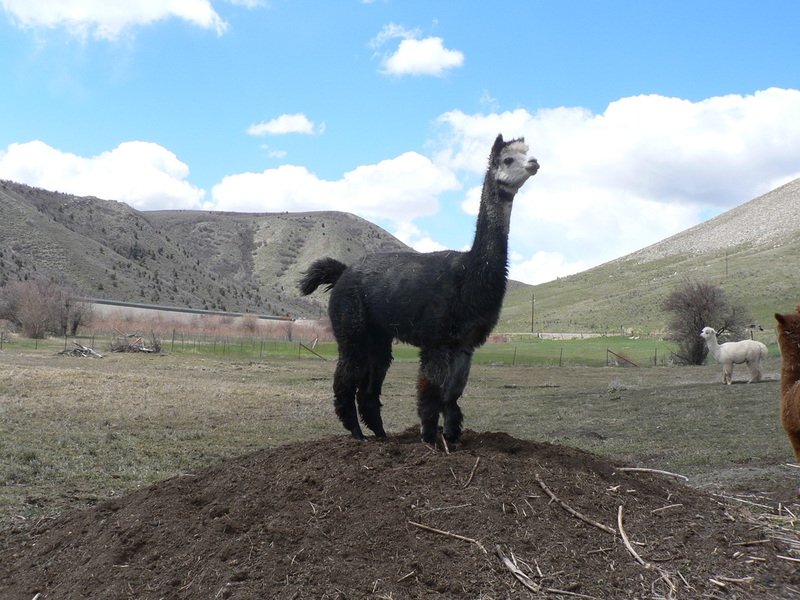 Latte is ready to bred and comes with a complimentary breeding and 6 months free board.